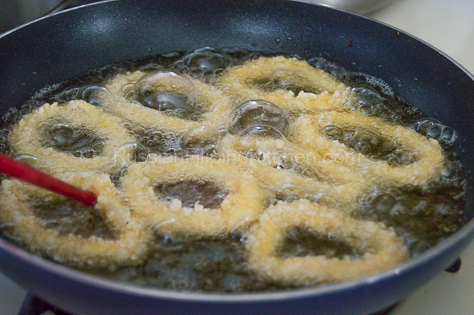 It can be prepared in a variety of ways–made into adobo, stuffed, sauteed, ginataan (with coconut milk), grilled, salted and dried, or cut into rings then dredged in batter and deep fried. 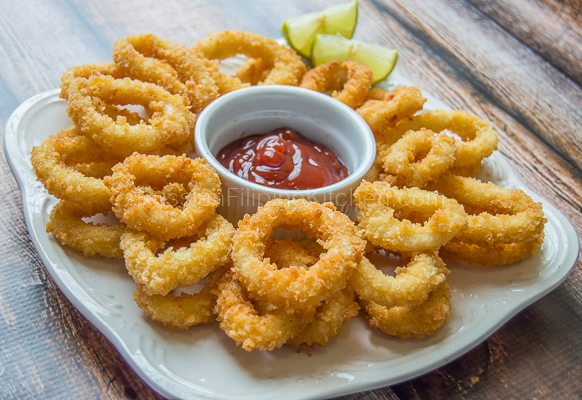 This deep frying method results in a crispy fried calamari that can be enjoyed as appetizer or “pulutan“. 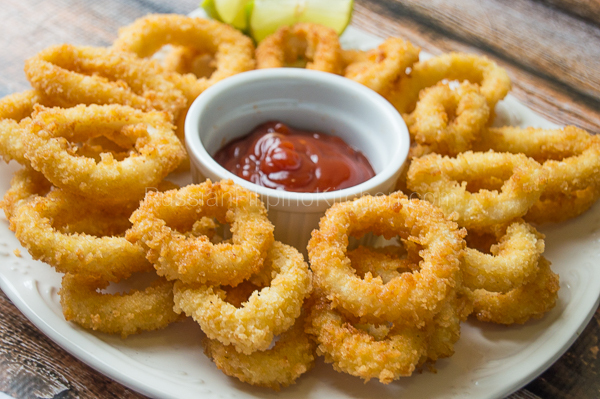 The secret to making crispy fried calamari is in the batter. 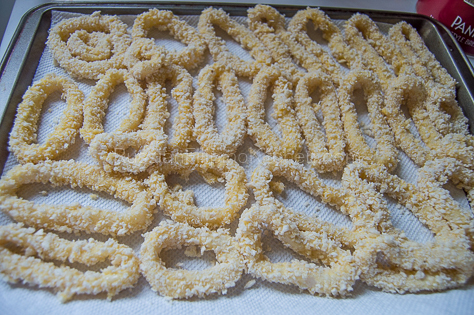 I discovered that an equal ratio of all-purpose flour and cornstarch is the key, and finally dredging the squid rings in Panko bread crumbs before frying does the trick. I’ve been using this recipe for years and it always produce consistent results. 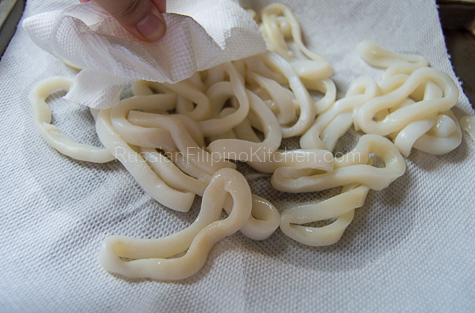 I often use frozen squid rings thawed under cold running water, although from time to time I use fresh or frozen squids then clean and prep them for this dish. 1. 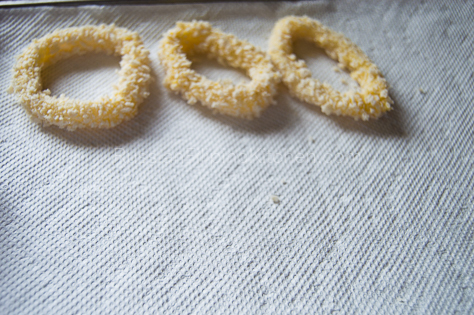 Pat squid rings with paper towels to dry. 2. In a small bowl, crack the eggs and lightly beat using a fork. 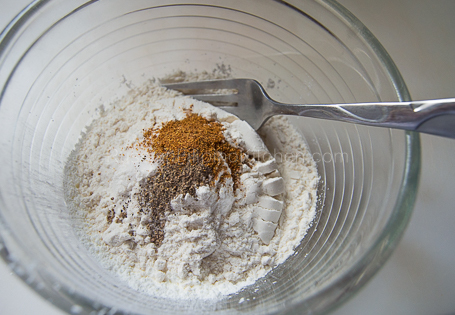 In a medium bowl, whisk together flour, cornstarch, salt, ground black pepper, and cayenne pepper. 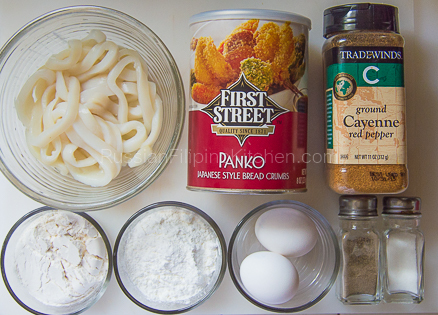 In a separate plate, place Panko bread crumbs. 2. Now with the breading. 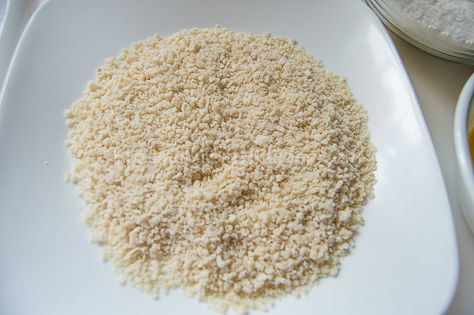 Coat individual rings with flour-cornstarch mixture. Use a chopstick to dredge the rings and also to pick them up. 3. 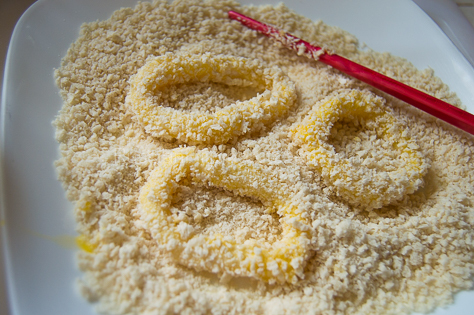 Dip flour-coated squid rings one at a time in beaten eggs.Use the other chopstick for this task. When the ring is fully coated with the egg, dredge it with Panko bread crumbs and place on a plate. Make enough for batch frying. 4. Heat oil over medium high heat till very hot (shimmering but not smoking). 5. 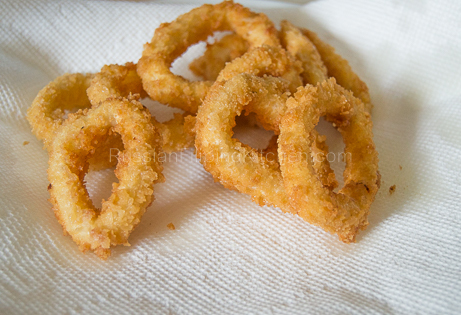 Drop individual squid rings onto hot oil and fry for 30 seconds on each side till golden brown. 6. Drain on paper towels to remove excess oil. 7. Fry up another batch till done. 8. Serve warm with favorite dipping sauce. Pat squid rings with paper towels to dry. In a small bowl, crack the eggs and lightly beat using a fork. Now with the breading. 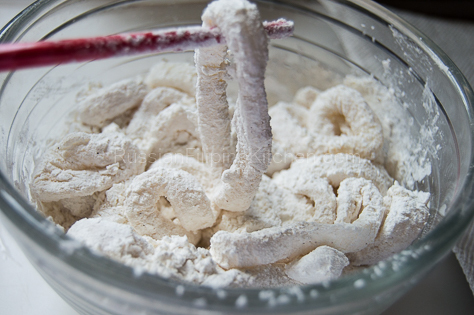 Coat individual rings with flour-cornstarch mixture. Use a chopstick to dredge the rings and also to pick them up. 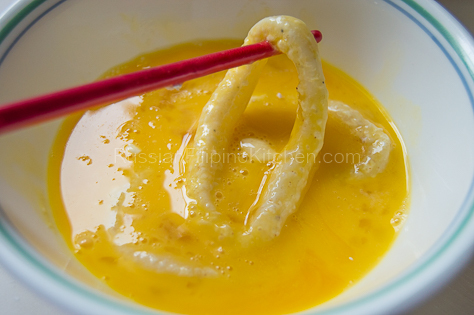 Dip flour-coated squid rings one at a time in beaten eggs.Use the other chopstick for this task. When the ring is fully coated with the egg, dredge it with Panko bread crumbs and place on a plate. Make enough for batch frying. Heat oil over medium high heat till very hot (shimmering but not smoking). 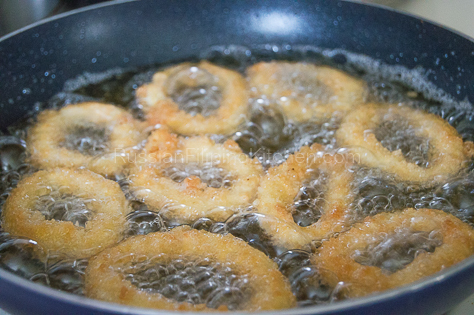 Drop individual squid rings onto hot oil and fry for 30 seconds on each side till golden brown. Fry up another batch till done. Serve warm with favorite dipping sauce.